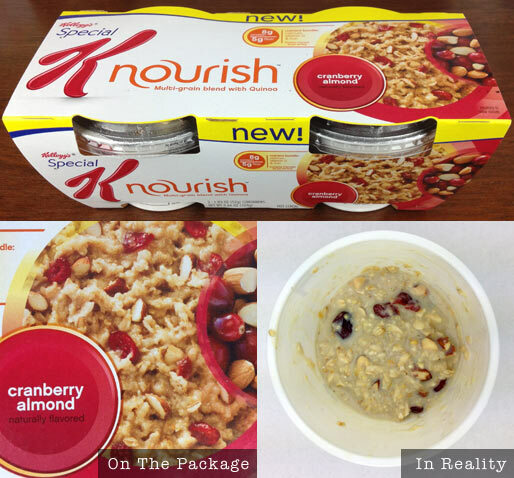 I tried two varieties of Kellogg's new Special K Nourish Hot Cereal: Maple Brown Sugar Crunch and Cranberry Almond. Both cereals are described on their packaging as a "multi-grain blend with quinoa." The instructions are easy. You fill the serving cup about 1/3 full with hot water and stir with the grain blend. Cover and let set 3 minutes. Then, stir in the add-ins that are adhered separately to the top of the container. The first thing you should know is that the servings seem incredibly small. The cooked cereal doesn't even reach the half-way point of the serving cup. I found one serving to be too small and two servings to be too much... a classic Goldilocks situation. The Maple Brown Sugar Crunch variety has an almost a smokey or woodsy flavor which paired well with the complexity of the grains. The nut add-ins provide a genuine crunch, great flavor and texture differential that makes this hot cereal interesting. It's has just the right amount of sweetness. You won't want to add extra maple syrup or brown sugar. I also liked the Cranberry Almond variety. The crunchy almonds are the star of the serving. They're the element that make this product stand out from other hot cereals. There's a pleasant cranberry taste throughout the cereal even if you don't get an actual cranberry. When you get a bite with a cranberry and almond, this cereal really shines. Pressed to pick my favorite of the two, I'd pick the Maple Brown Sugar variety. There's a uniqueness to it's flavor that works a little better with the combination of grains. The other variety, while good, reminded me more of a nice bowl of oatmeal. Each single container of the Maple Brown Sugar Crunch variety has 190 calories, 5 grams total fat (0.5 grams saturated and 0 grams trans), 0mg cholesterol, 140mg sodium, 32 grams total carbs, 5 grams dietary fiber, 11 grams sugar and 8 grams protein. Each single container of the Cranberry Almond variety has 190 calories, 4.5 grams total fat (0.5 grams saturated and 0 grams trans), 0mg cholesterol, 150mg sodium, 33 grams total carbs, 5 grams dietary fiber, 12 grams sugar and 8 grams protein. 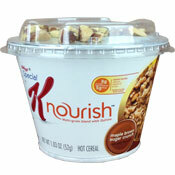 What do you think of Special K Nourish Hot Cereals? The container size is misleading - the actual cereal is only 1/2 of the cup. Expensive for the quantity. Taste is fair. I was extremely disappointed by the miniscule amount of cereal contained in the individual cup. Special K packages what appears to be a reasonable amount of cereal from the container size when in fact the cup is less than half full after water is added. This fact is exacerbated by the fact that this cereal is pricey. 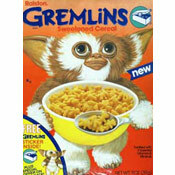 I like this cereal... but they need to lower the price. Not much value for the money, but it tastes good for the little bit you get. Too expensive for 2 small containers. I need to get the ingredients and portion out servings for quick use. I tried the cinnamon raisin pecan and found it to be very tasty and very easy to prepare. Portion size seemed a little small and price seems quite high. I can not believe I wasted my money on this product. I purchased the cranberry almond knavish and it was rotten. The cranberries and almonds tasted rancid. My daughter loves special K so I wanted to give it a try. Well, I will stick to my regular oatmeal from now on. THANK YOU. I WANT MY $1.50 I PAID FOR IT BACK. I thought it was just the right size serving. The only issue for me is the cost. Will look for it on sale and stock up. I really like this cereal, I don't eat much for breakfast so it is perfectly per portioned & filling. It really tastes great! I wish that they would sell 4 packs & lower the price a little though. It is great for someone who does not have a lot of time in the mornings to prepare breakfast. My biggest issue with this product is the sugar content: 12 g per serving. Very good and good portion size also. Portion is small but enough. Add half a chopped apple to increase the portion size if needed. Not worth my money. 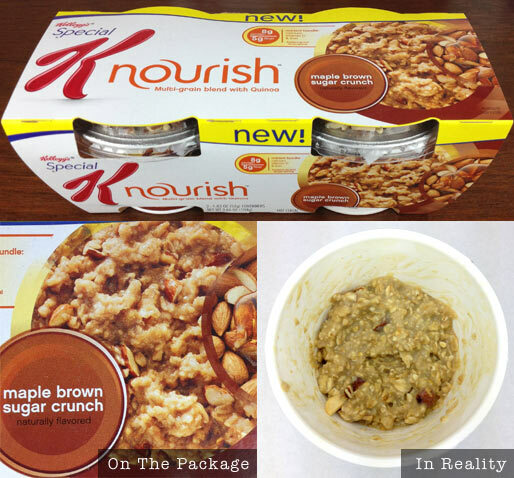 You get just a few spoonfuls of oatmeal and some of the almonds tasted rancid. I don't think so. Costs too much compared to oatmeal and I'm very satisfied with oatmeal.